It happens to most San Marcos residents at least once in their life. Your teeth become sensitive to cold drinks. A tooth develops a dull ache. A sore on the gums doesn’t heal up. An injured tooth darkens. A pain develops in your lower sinus area. This is not a situation where ignoring it will make it go away. If the pain is the result of a detrimental infection, there are grave consequences of postponing treatment. Oral bacterial infections can destroy teeth, gums, and jawbone, lead to life-threatening sepsis, and ruin oral health in San Marcos CA. In fact, prior to the 19th century, tooth decay-related infection was a leading cause of death. An oral infection doesn’t always cause pain. Bad breath, fever, swelling in the gums, glands or jaw, or a strange taste in the mouth can indicate the presence of an infection. Look for signs of declining oral health in San Marcos CA whenever you’re brushing your teeth. If an infection is caught and treated early, there may be no additional problems. 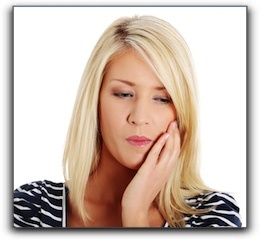 Usually, the infection is the result of a dental trouble that needs to be treated. If the infection is caused by tooth decay, the decay will have to be removed and the tooth filled. If the decay has penetrated to the pulp of the tooth, a root canal may be necessary. Mouth sores have various causes including an infection or virus. White patches in the mouth can indicate thrush (an oral yeast infection). All these conditions can be treated, but you need to see your dentist immediately. If you have any signs of oral infection or haven’t had a dental exam in the past year, we encourage you to meet with us. To improve your oral health in San Marcos CA, schedule an appointment by calling our office today at 760-633-3033. We also offer several general and cosmetic dentistry services such as teeth whitening, dental implants, and emergency dentistry.